Just out of curiosity, I noticed an unusual pop-up the last time I visited lego.com. I have never seen it before and have not been able to find it since. It asked whether or not I would be willing to answer some questions for lego. It had a green background and was a little more grainy than I've experienced their website to be. I didn't answer any questions. But I was wondering if anyone else has seen this pop-up? I'm pretty sure the LEGO site has satisfaction survey pop ups every now and then. Why it was grainy I don't know but I've seen them before. I usually say no as well mostly because the questions always seem worthless to me. I get this pop-up almost every time I visit LEGO.com. I never filled it out, but it is probably done by a third-party service, so that could explain the different quality. Where you from, How old, what visited for, did you get what came for, score these phrases (agree/not), would you recommend, reason for answer, and suggestions how site might be improved. (i suggested a comprehensive tutorial on the power functions products, how they can be used together, etc). I get these pop ups every so often and usually take the time to complete them. I always ask to have more details about the "Retiring Soon" sets. I think I attempted to fill in this survey recently, but was stumped by a question where none of the possible options were correct, but it forced me to pick one anyway. I just gave up at that point. 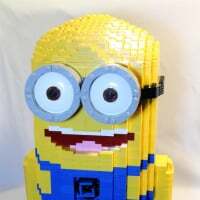 ^ "How would you rate the enjoyability of Lego? A. Elephant, B. Knitting, C. Cumulonimbus, D. Stalactite, or E. All of the above except the last one." Yeah I hate it when customer surveys go all 'interpretive dance' on me, needlessly muddling themselves so they have to translate our confused and nonsensical answers to their equally irrelevant questions, and back again to extrapolate something worth reporting. Question 1: You are walking along a dimly lit corridor, up ahead the path ends at a heavy wooden door. Do you turn left and take the East passage, turn right, and take the West passage. Or do you investigate the door further. What? How does this help your understanding of my buying habits? Aah, you poor unenlightened non-statistical person, if we were to ask 'What do you like/not like about this site' then our degrees in Talking B*llocks While Nodding Sagely would be wasted.